These worksheets can be ordered from My Store at https://www.teacherspayteachers.com/Product/Get-in-on-the-Act-I-Beginner-Grammar-Video-Worksheets-2064099 or from me directly at dianafuntanaesl@gmail.com. Now watch, listen and learn! Diana interviews international news correspondent and world traveller, Adie Ventura, about her fascinating travel experiences. Student Annie Ball answers an ad for an apartment in the newspaper, but is there anything strange about this one? 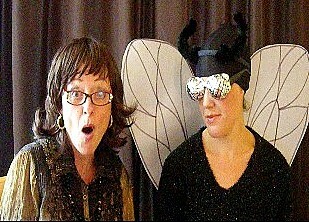 Diana interviews the Amazing Human Fly. What amazing things can she do? Peggy Pringle starts up a conversation with Diana while waiting for her flight to Vancouver. Diana’s guest on What Am I is ESL teacher Peggy Pringle who tries to guess the identity of the special mystery guest and win $10,000. Please add a comment including your last name and organization or “Like” on Facebook or your favorite pages! Hey, that’s fantastic, thanks for these nice videos! I’ll sure use some of them in the classroom.